Ian Strange aka Kid Zoom‘s latest work is FINAL ACT, a project somewhat similar to last summer’s very surprising and impressive SUBURBAN. The results of the project are on display now at the Canterbury Museum in Christchurch, New Zealand. 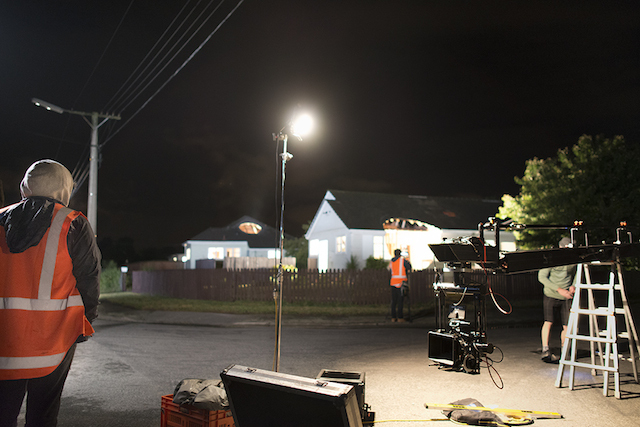 As you can see in the photos and video in this post, the work involved artfully deconstructing four homes in Christchurch. The process was heavily documented in video and still photography, as were the results of the deconstruction. 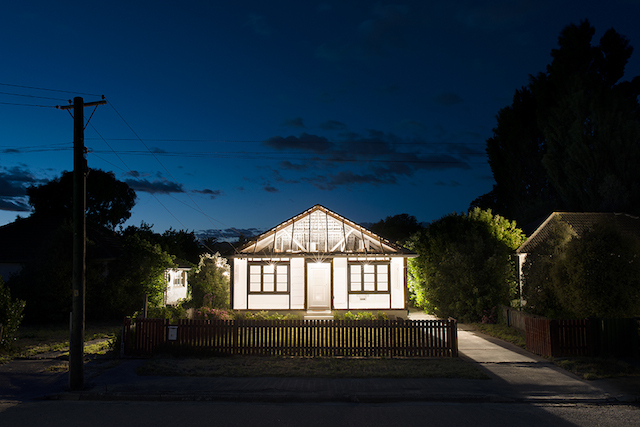 Really, the final artworks in this project are the photographs and films (and some sculptures that come from the process of cutting up the homes), and that’s what is on display now at the Canterbury Museum. It’s all a part of the Rise Festival that’s going on there now, and Ian’s response to the earthquake that shook Christchurch in 2011. If I remember correctly, Ian and I discussed the work of Gordon Matta-Clark when he first showed me some previews of SUBURBAN. SUBURBAN seemed to me like a uniquely Kid Zoom project, but also clearly influenced by Matta-Clark. And there’s nothing wrong with influence, especially if you bring a fresh perspective. I feel that Ian’s work does that. 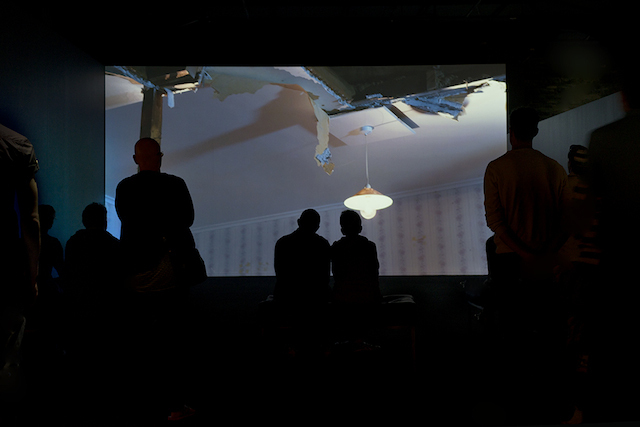 Because he incorporates these intricate photography, videography and lighting setups (as well as paint in the case of SUBURBAN), there’s something different going on than what Matta-Clark was doing. 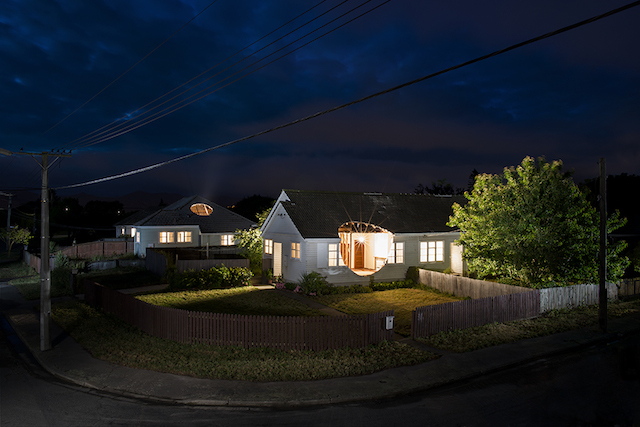 And Ian has grappled with ideas of suburbia in his work for years before FINAL ACT or SUBURBAN, and he’s also acutely aware of the power of documentation. So the work has a different impetuous and a different meaning from Matta-Clark. Still, when I saw the photos of FINAL ACT, I could not help but say to myself, “Wow. I can’t believe Ian’s just taken a quintessentially Matta-Clark visual and thrown in some fancy lighting, and then done some quintessentially Matta-Clark sculptures.” I suppose I could have brushed this off, except that nowhere in any official descriptions of FINAL ACT could I find a reference to Matta-Clark. It’s not like there was no explanation of the project. There was a written press release, and a sort of making-of video has been released in addition to the 12-minute video art piece and the still photos. Why, in none of that supplementary material, would such an essential reference point be neglected? It would be like this Sherrie Levine piece being described or displayed without any reference to Duchamp. That neglect rubbed me the wrong way. In the Juxtapoz-friendly art world (or maybe just among PR people), I’ve found that it’s just not usually considered cool to acknowledge an artist’s influences or references unless they are somehow subversive or could be a way of getting more press attention (ps: that’s not a dig against Juxtapoz, just a way of describing a very large scene). I’m guilty of falling into similar traps sometimes too. 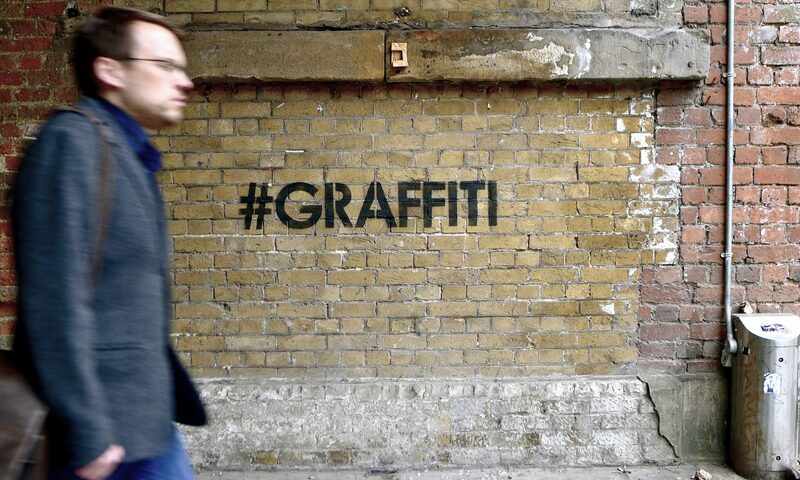 There’s a lack of critical exploration of the artwork that blogs like Vandalog cover, and examples like this going unacknowledged only continue that pattern. And it’s even worse that museums perpetuate the same issues when education is one of their traditional responsibilities. Matta-Clark is a huge influence on my work – Also artists like John Divola, who’s work documenting suburbia and his vandalism series using aerosol, also his recent dark star series. In Final Act, the initial idea was to use light if it was paint – Allowing the negative space of the cuts to be filled with light and in a sense be an extension of the painted gestures and markings from Suburban. 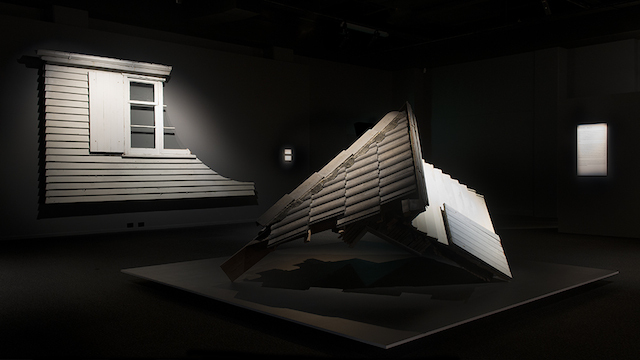 The house cut works in the exhibition have a strong reference to Matta-Clark’s work. 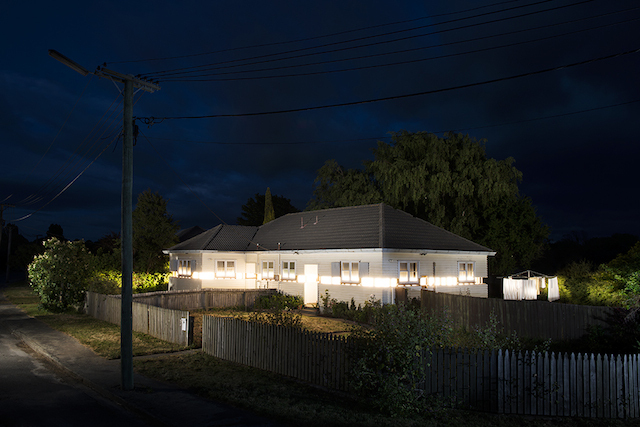 But in this this body of work they were also a way for me to physically archive the Christchurch homes in their museum. The homes I worked on will be demolished, along with the entire neighborhood they are in, that neighborhood is part of over 16,000 homes which will be eventually demolished. 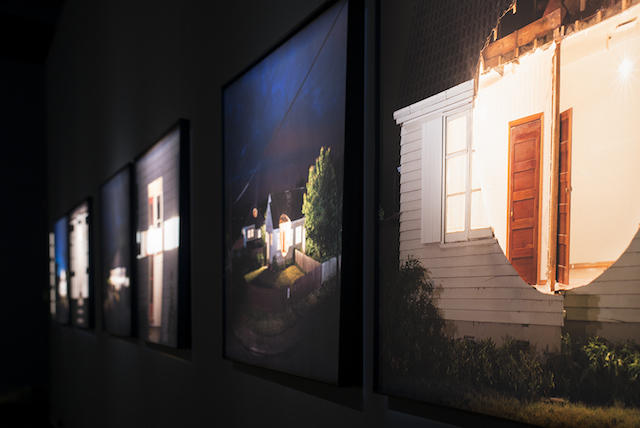 I was interested in the works being artifacts which will remain long after the homes are gone – Ultimately I would have loved to move an entire house into the museum, which wasn’t possible. That’s a well-considered and enlightening comment in what was almost an immediate reply to my email, so it couldn’t have taken too long to write up. And Ian has mentioned Matta-Clark in interviews before, so it’s not like he’s been trying to hide anything. Why couldn’t something like that have made it into a press release or some wall text in the museum (and if someone has been in the museum and they do have some wall text like this, please let me know, but it seems unlikely to me given the text I’ve seen about this project)? While I still thing the similarities to Matta-Clark’s work are a bit much in FINAL ACT (less-so in SUBURBAN), I appreciate that Ian is trying to do is a bit different. While I suppose he would argue that it’s more than this, I see FINAL ACT as a modern update on a classic, and there’s nothing wrong with that, as long as we acknowledge it.